So apparently, I was one of the few people digging this collabo as evidenced by the fact that the Target/Neiman's collection is now 50% off in stores and online. Just in time for the holidays. Thank you! Some of the consumer comments were that the quality did not match the price. I find that with all of the collections. Certainly, every piece is not a star but there are always a few gems to be found especially at the price point. I mean it's faux couture, not the real deal--give me a break. Admittedly, in this collection there were a few items that raised eyebrows with regard to price ($250 bicycle no thank you!). 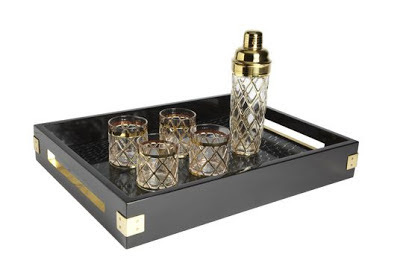 However, my favorite item in the collection was the Joseph Altuzarra bar set--which is a fabulous deal at the sale price. Got it. I love the vintage feel of the set and the posh gold accents. I am excited to have another get together where I can break this set out. I highly suggest you visit target fast. Especially, if you had your eye on something initially but were put off by the prices. Stay Posh!